The FIA is reportedly set to advice Formula 1 drivers against offering 'rides' to their adversaries, F1 Asphalt has learned. 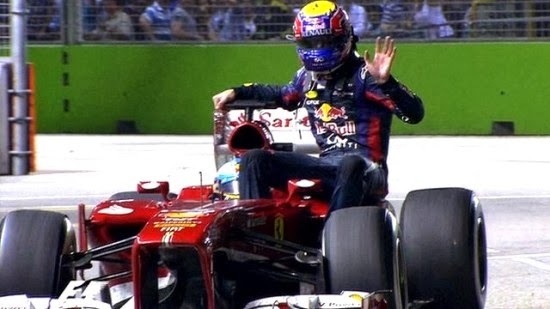 This issue of course came to the forefront after the Singapore Grand Prix, where Fernando Alonso gave Mark Webber a 'taxi ride' back to the pits after the latter's car gave up on the last lap of the race. It is vital to point out that the reprimand was not for the actual ride back to the pits. Alonso was punished for breaking article 30.13 of the sporting regulations, which relates to cars being "driven unnecessarily slowly, erratically or in a manner which could be deemed potentially dangerous to other drivers or any other person". Webber's was reprimanded was for breaching article 30.9 (b), which only allows drivers to be on the track if they have first received permission from a marshal. It was later learnt that Webber did not have permission to run on to the track, and was specifically instructed by the marshals not to do so. The issue is set to be discussed at the next F1 driver's briefing before the Korean GP. We understand that the FIA does not plan to 'ban' such 'services', however they are keen to clampdown on the safety aspect. Drivers are set to be recommended not to offer such lifts, or risk punishments which will be dealt out if a driver stops to pick someone up in the manner that Alonso did, or if drivers run out onto the track without a marshal's permission. This would, in effect, end all such 'lifts' as drivers will not be allowed on track while cars are around to pick them up. The FIA is worried that even travelling at slow speed (100 kmph in this case) on the way to the pits, it is possible for something to go wrong and a driver sitting on the side of a car could fall off. Singapore steward, former Formula 1 driver Derek Warwick, agreed: “It is not health and safety gone mad. “We have become a bit sterile in many ways in Formula 1,” Warwick continued. “But we cannot put drivers at risk.